Rebels for Life, moderated by Mr. Brian Klisavage, is Seton-LaSalle’s political club established to make students aware of life issues involving the many unjust acts happening in society – abortion, human trafficking, use of stem cells, and the injustices upon the special needs community. The club subverts injustice by planning activities, fundraising, and volunteer work to allow students to be involved in the community and make a movement through their actions. 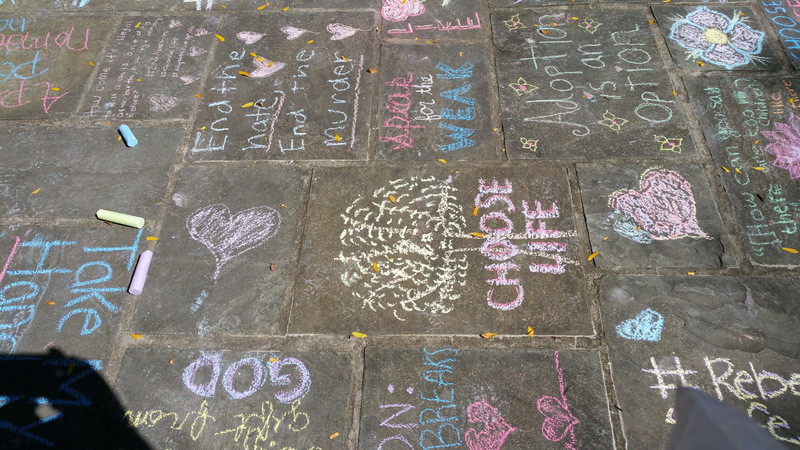 As the first activity of the year, Mr. K and the Senior leaders held the Sidewalk Chalk Day here at Seton-La Salle to give the students the chance to speak their mind about pro-life issues. Rebels for Life held its first meeting this week to promote awareness of the different topics of life issues. With the help of the Senior leaders of the club, the students are becoming aware of the problems being faced in society that no one usually talks about. Topics about abortion, human trafficking, the use of stem cells, and injustices in special needs community were presented to let the students know the cruelty and reality of each of these life issues and encourage them to show respect and give value to every life. Seeing the presentations and videos about these wrongdoings being committed in society impacted the students. The meeting was successful and had a positive reaction from the students. They asked questions and were very interested to be a part of the upcoming activities and fundraising for this coming year to promote awareness and help stop these life issues. Each year, many students come to the March for Life to promote pro-life and protest against abortion. Rebels for Life has also planned out volunteer and charity services to local home shelters, pregnancy research centers, and have held prayers outside abortion clinics. This coming year, the club is planning more volunteer and fundraising events to give donations to support the pro-life movement. With the influence of young kids, we hope to make a difference in society. Rebels for Life is a great cause that will encourage, support, and allow students to take a stand and do something about these problems through their words and actions. Every life is important and should never be taken away. Each person should be given respect. Come and join us fight for a cause and learn about the upcoming plans for this year!